Mount Whitney is the highest peak in the lower 48 states at 14,479 feet. You can hike to the top of Mt. Whitney, however you do need a permit. It is at least a 12 hour hike and many take it with at least one overnight as it is very strenuous due to the altitude and lack of oxygen. It is located at the boundary between California's Inyo and Tulare counties. The western slope of the mountain lies within Sequoia National Park. Mount Whitney is the southern terminus of the John Muir Trail, which runs 211.9 miles (340.9 km) from Yosemite Valley. Mount Whitney was named after Josiah Whitney, the State Geologist of California. It was first climbed in 1873 by fishermen who lived in Lone Pine, California. Mount Whitney is just 76 miles (123 km) west of the lowest point in North America, in Death Valley (282 feet (86 m) below sea level), and immediately rises just over 2 miles (~3,300 m) in elevation above the floor of the Owens Valley. Mt. Whitney is about 1.5 hours south of Mammoth Lakes. 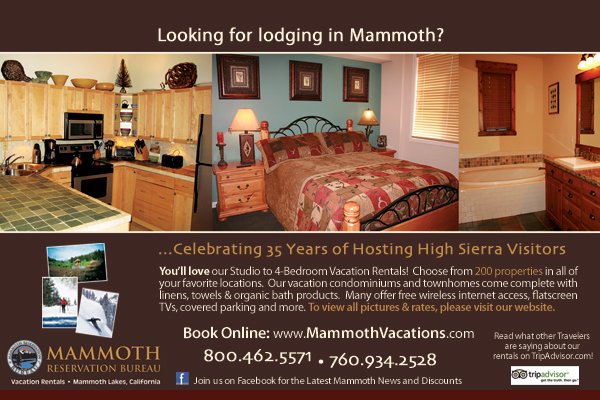 Often people who get a Mammoth condo rental drive down to the Mt. Whitney trail head for a day of hiking and photo taking.